People often associate Chicago with hot dogs and deep-dish pizza, but thanks to the city's thriving Vietnamese population, we also have some of the best bánh mì around. 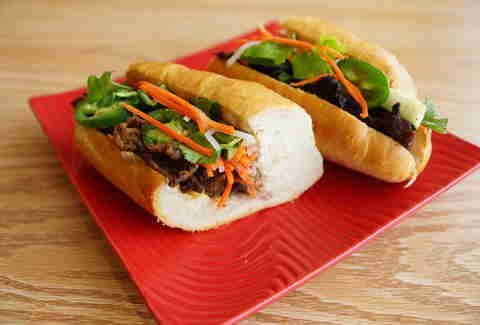 "Bánh mì" actually refers to the bread -- traditionally a baguette -- but people have adopted the term to refer to the entire sandwich made with meat, pate, head cheese, pickled vegetables, cilantro, peppers, and mayonnaise. We sampled a handful of variations of this craveable, inexpensive sandwich and narrowed it down to a list of the best in Chicago. You're welcome. If you're in Wrigleyville or Boystown, don't overlook this gem. Though it's unassuming, BB Bun Mi Express serves a better bánh mì than some of its flashier neighbors. If the Saigon Classic (a "standard" bánh mì made with ham, head cheese, pork roll, and pate) seems a bit heavy for you, opt for a lighter lemon grass tofu sandwich served with pickled vegetables, cucumber, cilantro, and jalapeños. A sandwich lives and dies on the quality of its bread, and though Nhu Lan Bakery's pate is exceptional, where it really excels is in the baguettes. Crusty on the outside and soft on the inside with an intensely satisfying crunch, they're the perfect setting for the sandwich's meaty layers. Precious few places serve a breakfast bánh mì, let alone one like at Lotus Cafe. The Sunny-side Beef features an egg on top of rib-eye steak, caramelized onions, and sweet potato fries, and is good for any time of day. 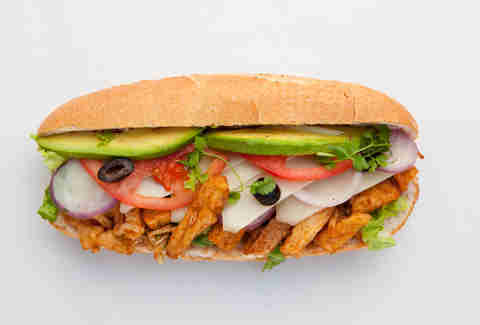 For a healthier option, try the Veggiecado with crispy-thin fried tofu, sweet potatoes, and, of course, a healthy portion of avocado. Wicker Park's Bon Bon Vietnamese Sandwiches' menu is a mishmash of Asian foods, including pho, ramen, and Korean wings. Bánh mì options range from a classic made with head cheese to the umami-rich vegan ham sandwich with a walnut/mushroom pate. A favorite in Little Vietnam up by the Argyle red-line stop, Ba Le now boasts a second location in the Loop, making it one of the few restaurants there that won't charge you $15 for lunch. Like Nhu Lan, Ba Le bakes its wonderfully chewy bread daily. It boasts a variety of out-there fillings like scallops, prosciutto, and cod, plus all of the traditional bánh mì add-ons. There's plenty to choose from at Co Co, but the consensus seems to be that if you make it out to this Ravenswood spot and don't order the pork bánh mì, you're doing it wrong. Though the neighborhood isn't generally known as a place to get quick Vietnamese eats, Co Co gives Argyle's finest a run for their money, especially if you're looking for a small bowl of flavorful pho to go along with your sandwich. 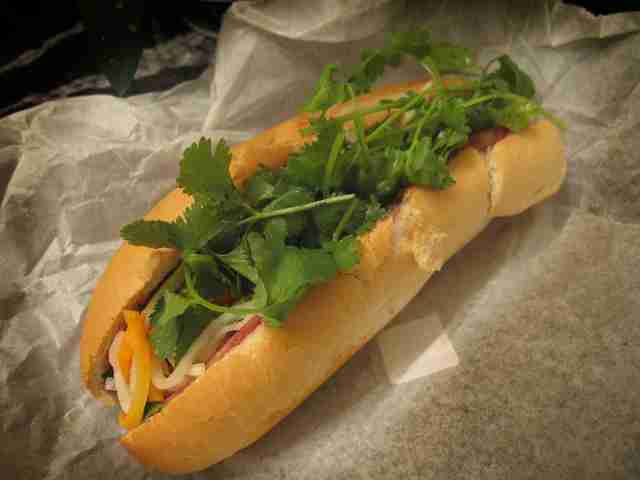 Saigon Sisters serves a pretty mean bánh mì, but you'd be remiss not to try the bánh bao. Imagine all of your favorite fillings from a bánh mì sandwich nestled in a steamed bao bun. It's heavenly, especially if you order it with pork belly. Let's start with the most important thing here: the combo specials. Eight dollars gets you a sandwich, soup, salad, egg rolls, lemonade or tea, and fruit for dessert. It has your standard assortment of sandwiches, from chicken and beef to pork roll and pate, but you'd be a fool not to try the roast duck or caramelized pork belly sandwich. 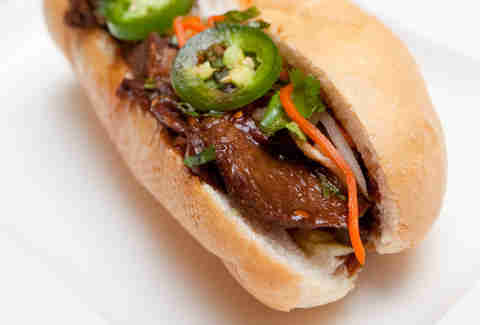 You'll be missing out big time if you don't order the bánh mì bò kho. Resembling more of a French dip, it's essentially a beef stew sandwich, full of umami, brightness, and body from beef tendons, carrots, and lemongrass. If your mouth isn't watering right now, you're either a vegetarian, or you're dead inside. Nha Hang Viet Nam knows what it's doing in terms of putting together a mind-blowing Vietnamese sandwich. 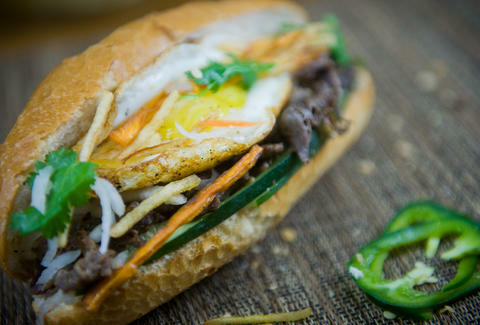 You can get yourself one and a bowl of pho for under $15, and the standout on the menu is the bánh mì ốp la, the breakfast version stuffed with sunny-side-up eggs and soy sauce. Sam Greszes is a Chicago-based eater who occasionally writes things too. Follow him on Twitter @SamGreszeseses, or on Twitch at RobotsFightingDinosaurs.